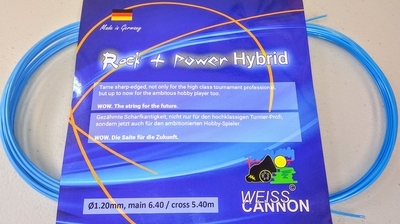 WeissCANNON, a true innovator in the world of tennis string manufacturing, is highly respected due to the quality and diversity of the product line they have developed. This prepackaged hybrid is pure awesomeness! The sharp edged main provides wicked spin while the comfy round cross string provides added feel. A winning combination! Construction: Mains are the wicked good Blue Rock 'n Power and crosses are round poly based. Advantage: Profiled strings pair beautifully with round partners and this combination is as close to perfect as possible.